By buying from our NCI Approved Property List – we take the worry out of your purchase. By purchasing through NCI you gain reassurance about the question at the forefront of every property hunter’s mind: “Will I get a title deed?” NCI guarantees to check the Title Deed status of all of our properties prior to listing on our website. Every individual property has the correct individual title deeds either ready to pass on to you, the new owner, or likely to be forthcoming soon during your purchase period or once the new-build site is completed. Because of the unique multicultural history of Cyprus, there is more than one type of title deed in existence in Northern Cyprus. These fall into two main categories: Pre-74 and TRNC Title. It is important to note that both types are equally “safe” to purchase and recognised equally and guaranteed by the government of the TRNC. These are Pre-74 Title Deeds (include British and Turkish pre-74 Deeds) and TRNC Title Deeds (include what was previously known as Esder or exchange and TMD). Pre-74 Title Deed land makes up only 10% of the North of Cyprus. Most of the entire population including the overseas buyers like you live happily in a TRNC title property. So which do you choose? Are both equally “safe”? Is one more valuable than the other? Take a fresh look at North Cyprus Title Deeds! Since March 2010, the consensus amongst international investors is that BOTH types of title deed in North Cyprus are equally “safe”. In fact, there is far more risk to yourself in buying from an unverified small developer who has an unpaid debt on his land, than you are by buying a TRNC title deed from an approved developer – hence the importance of buying from an approved range such as the properties on this NCI website. 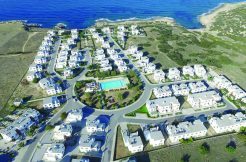 Before March 2010 (the date when the European Courts gave official recognition to the North Cyprus Immovable Property Commission) some investors preferred to buy ONLY pre-74 title deeds. Hence some of the old, inaccurate “anti-TRNC title” information on the internet. A Pre-74 Title Deed (Turkish and British) refers to land, or property build on land, which was always part of North Cyprus and never owned by Greek Cypriots. Turkish Cypriots tend to prefer to purchase this, if available, as it is sentimentally and historically “their land”. NB: Pre-74 Deeds now go automatically into the new owner’s name, the same as TRNC titles. A TRNC title deed refers to land, or new property built on land, which is a brand NEW title deed issued by the North Cyprus government since the division of the island in 1974. Any theoretical compensation due to a possible original pre-74 Cypriot landowner (if they are still alive) is since 2010 now being paid in full by the Immovable Property Commission upon application – and this system now has the full recognition of the European Courts of Justice. Buying a TRNC title deed, or looking at both types, will generally give you more range and types of properties to view during your inspection visit – as the majority of the land (including land near to sought after facilities like the Karpaz Gate Marina and Korineum Golf and Beach Resort) is only TRNC title land. In addition, you will find a better range of property prices too. However, which title deed to go for is very much a personal decision which you should make in consultation with your legal advisor. But don’t take our word for it! We recommend that you verify the information we give above with your own independent lawyer. During your NCI North Cyprus property visit, we are happy to provide you with a list of recommended lawyers. Call us now on +44 207 112 8060 to discuss the title deed issue and learn more about our approved range of both TRNC and Pre-74 title properties.